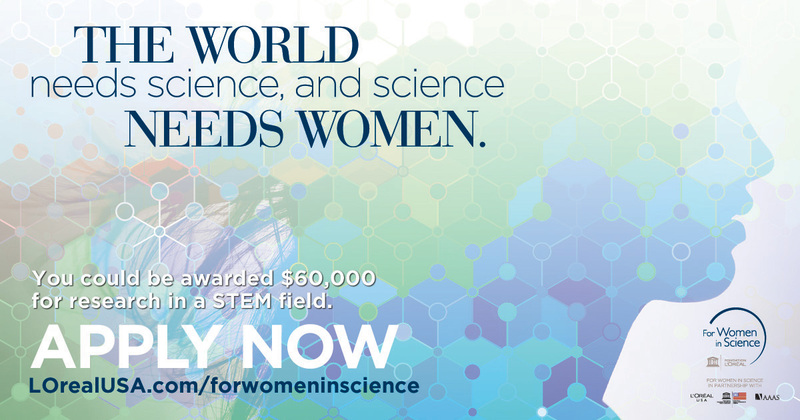 The L’Oréal USA For Women in Science fellowship program is a national awards program that annually recognizes and rewards five U.S.-based women researchers at the beginning of their scientific careers. Recipients receive up to $60,000 each that they must put towards their postdoctoral research. The program’s partner, AAAS, manages the peer-review process. An inter-disciplinary panel of scientists reviews all applications submitted. The top candidates chosen by the review panel are then forwarded for final selection to a distinguished Jury of career scientists and former North American L’ORÉAL-UNESCO For Women in Science Laureates. The Jury seeks candidates with exceptional academic records and intellectual merit, clearly articulated research proposals with the potential for scientific advancement and outstanding letters of recommendation from advisers. New to the program this year, applicants will also be evaluated in part on their commitment to supporting women and girls in science. The 2014 L’Oréal USA for Women in Science applications are accepted until May 19th. Winners will be announced in September 2014 and the award ceremony will take place in November in Washington, D.C.